The Transatlantic Dimension to the Conflict in Lebanon: Whatever Happened to the Responsibility to Protect? In this BASIC Paper, Dr. Ian Davis examines the U.S. and U.K. roles and responsibilities in the Lebanon conflict. He supports the call being made by many governments and civil society groups: that a political solution to the twin crises of Lebanon and Palestine must be the international community's urgent priority. Dr. Davis also highlights the importance of international law in coping with the conflict and argues that the international community should be prepared to contribute a sufficient military force with a robust mandate to create a zone of security along the southern border with Israel. He concludes the paper by proposing key principles for a lasting solution to the conflict. Copyright 2006 British American Security Information Council (BASIC). All rights reserved. 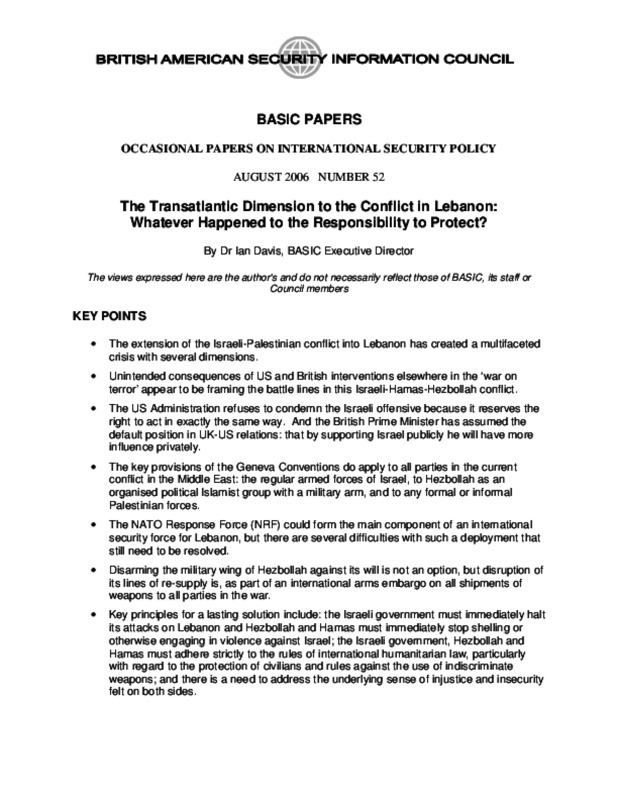 Title: The Transatlantic Dimension to the Conflict in Lebanon: Whatever Happened to the Responsibility to Protect?